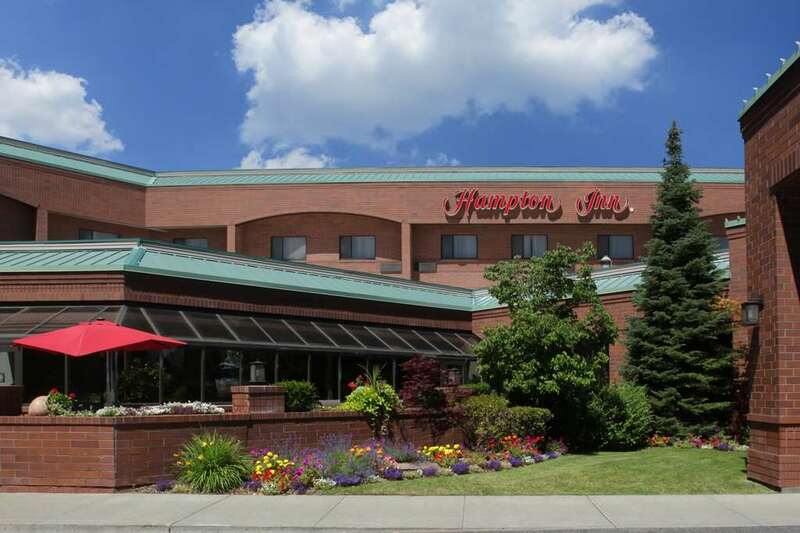 The Hampton Inn Spokane hotel in Washington is located four miles west of downtown and four miles east of the Spokane International Airport. Our hotel is near local attractions such as Finch Arboretum Indian Canyon Golf Course and Riverfront Park site of the 1974 World*s Fair Expo. There are several fast food or fine dining restaurants nearby our hotel. Dining options include Spokane House Restaurant Denny*s and McDonald*s or join us for lunch or dinner in the Garden Springs Pantry at the hotel. Enjoy fresh baked cookies and coffee every evening in our lobby. In Washington the Hampton Inn Spokane hotel offers all the great Hampton room amenities in-room coffeemaker iron and ironing board refrigerator hair dryer and cable TV with LodgeNet movies/games. The hotel also has a complimentary breakfast bar indoor pool a hot tub available 24-hours hot tub suites same day dry cleaning service boardroom and conference facilities and full-service catering. We are pleased to provide a complimentary 24-hour airport shuttle. We love having you here at the Hampton Inn Spokane hotel in Washington. Sunset Bistro: The Sunset Bistro is an American Bistro. Sandwiches and salads are made fresh daily. Menu items are adjusted seasonally. We offer an array of local wine and popular beer. The Bistro has recently been fully remodeled. The atmosphere is warm and welcoming yet modern and functional.